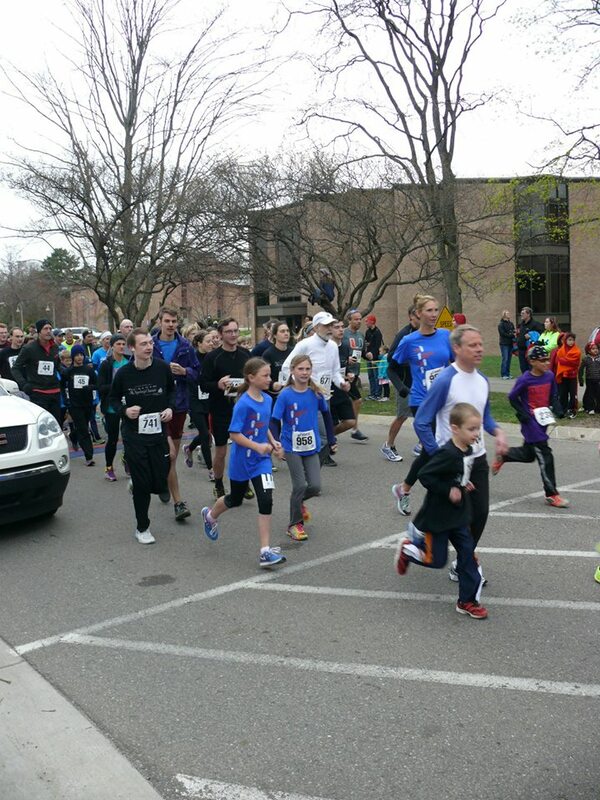 I recently ran in a 5-kilometer race, a fundraiser for college scholarships. I did pretty well, all things considered, completing the course a little more than a minute faster than the goal I had set. Admittedly, my goal was rather modest. A man pushing a two-seat baby stroller zipped past me on the downhills; I caught him again going up-hill. I was beaten soundly by several 9-year-olds and even a couple of 8-year-olds. At least I’m still ahead of the 7-year-olds! I’ve been a runner for about 40 years–longer than that, if I count a brief, dismal stint on my high school’s cross-country team. I never could run long distances very fast, but once I could run much faster than I do now. Around age 30, I could run comfortably at an 8-minute-per-mile pace; now, I typically plod along at about 11 minutes a mile. My ankles, knees, and hips all protest, so I can only run twice a week, not enough to improve. Age changes things. Why do I bother running at all anymore? And why did I enter a race in which at best I would finish in the middle of the pack? I run because exercise benefits my body. According to the Centers for Disease Control in Atlanta, older adults who exercise are less likely to die of coronary heart disease or to develop hypertension or diabetes. Their bones are stronger and they are less likely to experience falls or fractures. Admittedly, running is harder on the joints and more likely to cause injury than many other forms of exercise. Because of this disadvantage, I spend less than half of my exercise time running. I also go to the gym to use an elliptical machine, a stationary bike, and a rowing machine. I keep running not because I think it’s better than these other forms of exercise but because of what running means to me. I usually run early in the morning, when there are few cars on the road and hardly any people about. Houses along the route are coming to life; I have some sense of being connected with the inhabitants, though they don’t know I’m passing. Running through whatever weather is extant, able to go whichever direction I choose, I feel free. In contrast, trips to the gym tether me to machines–first the car I take there, then the exercise equipment outfitted with stirrups to hold my feet and displays to keep time and quantify my effort. Running also connects me to history in a way that gym machines can’t, all the way from ancient history (the Olympics, the plain of Marathon, Asahel and Abner) to my own history. I remember lots of places I’ve run and friends I’ve run with. I still have a t-shirt from the late 1970s that I received for participating in the Volksläufe (people’s race) still held annually in Frankenmuth, Michigan. No form of exercise (with the possible exception of swimming) evokes for me the rich memories that running does. Why I enter a race, though? I knew I wouldn’t win or even be best in my age group. I haven’t been in many races over the years–this was my 10th or 11th, and was the first one for about 5 years. I’ve thought some about what the appeal was, and I’ve come up with two things. First, when running with so many other people (over a thousand entrants), there is motivation to run as fast as I can. The drive is in part competitive: in this race, I put forth a good deal of effort trying to finish ahead of a guy who passed me near the first mile marker and whom I could tell was older than me. Beating someone else is less important than knowing I have done my best, though. A race gives me the opportunity to push myself to my limit and shows me what I’m capable of doing. The exhaustion that I feel afterwards is well-earned and thereby satisfying. Second, I like to see the other racers. It’s refreshing to know that there are so many runners living nearby. The participants were of all shapes and sizes, serious or casual, running in groups or alone, ranging in age from six to over eighty. We formed a very temporary community, moving forward together, a sweaty, straining convoy all with the same destination. For a few months after a race, my solitary runs don’t seem so alone because I know that many of the people with whom I ran will have continued putting on their shorts, lacing up their shoes, and heading out for a run, just like I do. So, I’m the old-but-not-yet-decrepit guy in your neighborhood, running rather slowly. I’m not out to prove anything. I’m just glad that I can still be doing this, thankful that my ankles, knees and hips have allowed me one more day that I can call myself a runner.